Slide inside a 40 meter tunnel long, Spin yourself fast on the bowl’s inner walls, And then take a 2-meter nose dive! It is F.A.N.T.A.S.T.I.C. No one can defy the strong gravitational pull of this slide. Slip into the Black Hole and find yourself lost in total darkness. You’ll be surprised that you’re about to take a plunge! Thrills at every twist and turn. You know from which side you entered the ride but have to make a wild guess which one you’ll end up with! The tube accommodates 5 people and will take you on a rough ride. You will scream your hearts out on this adrenalin-pumping raft ride. Left or right it does not matter. Race your way down on our twin Giant Body Slides. The gravitational power will speed you down to your splashing pool. A raging river between 2 gigantic slides will scream your raft down its stream. Hold on firmly and you will end up with a splash. Don’t mislead yourself. This ride may seem easy from the sidelines, but you’re in for a big, big surprise! No tsunami in Dreamland. This gigantic wave pool is the largest in the region. Slip into a pleasant dream in the Dream Stream. For dreamers only. An interactive Kids Pool designed with 19 game options to add to your toddlers and children fun. Stand below the big water bucket and get soaked to the bone! Live the Dead Sea experience in our high salinity pool. It’s one of a kind. Get yourself relaxed in the largest open jaccuzzi. Give your kids a challenge to pass our inflatable obstacles while you are relaxing. This is the best pool to enjoy water volleyball and basketball. Experience ultimate Dreamland Aqua Park’s overnight camping for 2 days full of fun, exciting rides and memorable experience or just enjoy our Cabana for a one day rental. Dreamland Aqua Park offers Waterside Camping, a unique service in the UAE for those who are on the lookout for a different, sensational experience. If your dream holiday features on land and in the water attractions, you can’t go wrong with a holiday in Dreamland; temperatures are always warm and you can chill out with your family and friends. The tropical atmosphere will amaze young and old alike! 2 days access to all water attractions during the park operating hours. Water side camping at our private camping zone in either cabanas or tents. Complete Camping Gear (Airbed Mattress, Pillows, Sleeping Bags, BBQ Stove and Cooler). Full Board Dining to include BBQ Dinner, Breakfast and Lunch. Shared sound system, sunbed lounges, camping tables and chairs. Access to Tennis Court and night swimming in designated pool. On duty lifeguard and security staff. We have 35 tents available which can accommodate upto 140 people. Bookings available from Nov. 1 to Apr. 30 every year. Dreamland will provide the complete Camping Gear with BBQ Dinner, Breakfast, and Lunch. Camping rates are per cabana/tent and are quoted per night. Camping rates are on full board basis (3 Meals Plan): BBQ Dinner, Breakfast and Lunch. Camping Supplement is applicable for extra accompanying guests. Bookings are required minimum 3 days prior to check-in date and subject to availability. 10:00 a.m. Park official opening time. Campers have the possibility to be admitted to the park and to enjoy all water activities after finishing check in procedure. 03:00 p.m. Accommodation allocation and handing over of tents and cabanas to campers. 06:00 p.m. – 01:00 am It is camping time. Campers may enjoy their BBQ Grills to prepare dinner, tea and coffee, play their preferred music and games, startup the bon fire and grill some marshmallows, access the Tennis Court for a night tennis session, or have a plunge in the designated pool. 01:00 am All camping lights will be dimmed down and music switched off. Campers are asked to observe each other’s comfort and respect our family atmosphere at all times. 12:00 noon Check-out time from accommodation. Campers are not allowed to bring raw meat, chicken, fish and Shisha inside the park. Canned and/or frozen foods are allowed. Public restrooms, showers, changing rooms and locker rooms are available for men and women. Lifeguards will be on duty until 2.00 A.M. Multiple entry/exit for campers is not possible after check-in. Dreamland Aqua Park is under no circumstance, responsible for the safety and wellbeing of campers, although a nurse, security staff (s) and lifeguard (s) will be available at all times. Guests are required to abide by the safety rules and regulations and code of conduct enforced at Dreamland Aqua Park. Dreamland Aqua Park has a wide choice of food outlets to serve you a variety of healthy meals and snacks throughout the day. Our all day dining indoor restaurant offers Continental & Mediterranean cuisine for up to 170 seated persons. Our menus are customized to satisfy different tastes and preferences from Mediterranean cuisine to the most exotic seafood dish. Don′t miss out on our sumptuous Continental Buffet served every weekend! Our all day dining indoor restaurant offers Continental & Mediterranean cuisine for up to 170 seated persons. Our menus are customized to satisfy different tastes and preferences from Mediterranean cuisine to the most exotic seafood dish. Don′t miss out on our sumptuous Continental Buffet served every weekend! Our delicious fast food meals are for kids and kids at heart. Snack Attack reigns supreme when it comes to all of the fun food you have to choose from. Grab some yummy pizzas, juicy burgers, Hotdog Sandwiches, crispy chips, fried chicken, and our tasty appetizers and salads or a frosty treat from the Slush Corner. After a long day of fun, relax and enjoy the sunset while savouring our hand toasted Lebanese Pizza (Manakeesh), Crepes and other delicacies or try our Shisha (Hubbly-Bubbly) in the Arabian Majlis. Looking for a fast bite with no queuing and hassle? Rush to the Golden Kiosk for a readymade cold sandwich, fresh fruit cuts or cool down with your best ice cream. The kiosk offers unlimited choices of all your refreshments including Soft Drinks, Juices, tea and coffee. Don&prime;t miss out on our Best Indian Combo Meal (Biryani) and Lebanese Shawarma (Raps) served every weekend! Ideally located at the center of attractions with easy access to all the rides, the UAE&prime;s largest pool bar offers a variety of alcoholic and non-alcoholic beverages in a real tropical atmosphere! Feet in water and grooving to our In House DJ Beats. Dreamland′s Catering Services will add a touch of difference to your event - be it and outdoor or indoor event like family day out, wedding reception, product launch or a corporate one. Offering a high level of services, our professionally trained team can serve at a private gathering of 25 guests or a grand banquet for 1500 guests with equal ease. And when it comes to food, our customized menus offer choices of specialties from Arabic, Indian and Continental cuisine. Lockers are free of charge on first come first served basis. Secure all valuables and belongings at the lockers or with a friend at all times (All unattended items will be removed). The park is not responsible for any loss or damage of personal belongings in its vicinity. Dedicated male and female changing rooms are located next to lockers room. Changing rooms has cubicles for changing, showers, lavatories and toilets. Please note that changing clothes in public areas is not allowed. For your hygiene please take shower before and after entering any pool. Ready to get sweat in our basketball, tennis & volleyball courts*. A great way to enjoy some group games and activities and dry out under the sun! * Rental charges may apply for certain games. This facility is reminiscent of the great Roman coliseum and can accommodate 1500 seated persons in a setting perfectly adapted for musical concerts, corporate events and shows. Enjoy watching our selection of domestic animals and have a photo with your most favorite animal. Looking for privacy and a relaxed day out while still enjoying all the fun! Look no further! Now you can opt either to rent your Private Wooden Cabana for the Day by the Camping Area or your VIP Lounge by the Pool Bar. If you seek comfort and relaxation then chill out at Dreamland Aqua Park in your own private Air-conditioned Wooden Cabana, ideal for families or small groups! It′s your own piece of paradise complete with airbeds, sun lounges, camping chairs and tables, all set in a private camping zone with proximity dedicated toilets and showers. Dreamland Aqua Park features a total of 10 Wooden Cabanas. For guest safety and comfort numbers is limited to 4 persons only per cabana. Priority booking is given to Overnight Campers and families with children. Day use bookings are subject to availability on same day of visit. Day use timing is from 11:00 am till 06:00 pm. Day use rental is AED350 per cabana. If one day is not enough for you, then enjoy our overnight camping experience for 2 days/1 night of fun and unforgettable moments. It′s the most exclusive way to experience Dreamland Aqua Park! To know more please check our Camping section. Privately set in the center of action, the VIP Lounge is a perfect and exquisite venue for group of friends and families looking to be indulged in a party mood all day long. Located by Pool Bar area, with proximity access to all main rides and attraction makes it the ideal location. Each lounge is furnished with ample sitting arrangements, service tables, sun lounges, shades and umbrellas, as well as, a dedicated butler at your service to attend to all your needs and requests! Welcome drinks and appetizers upon arrival. A non–refundable credit of AED500 to be used on all F&B consumptions. To book your VIP Lounge, ask your Ticket Booth Attendant upon admission. Forget your swimwear or run out of sun lotion? Dreamland′s Aqua Park shops are fully stocked with everything you′ll need for your stay at UAE largest family waterpark. There′s something for everyone whether it be in our swimsuit collection, footwear and flip-flops, clothing, souvenirs, toys and novelties or many of the other products we carry. You can visit the "Blue Waves Shop" for all the above or grab your need from the "Mini-shop" and feel at your local mini-market. If you have any products that you would like to see in our store, please let one of our friendly customer services know and we will do our best to provide you with it. Height and Age will be verified upon admission. Please have a valid ID at all times. Admission Rates as well as operating schedule are subject to change without prior notice. Please note that no refund policy is practiced. There will be no refund for any ticket due to any reason including inclement weather, power outage or mechanical failure of any ride. Bringing own food and drinks are not allowed into the park premises. Pets and items judged hazardous and dangerous, as well as, personal floating devises are not allowed inside the park premises. For your safety and convenience please refer to Park Rules and Regulations for admission code, dress code, safety code and code of conduct. 25% Off for accompanying guest ( Limited to 4 guest per visit ). Dreamland Aqua Park offers attractive rates for groups of 15 or more. The Park is known as a popular choice for School Outings, Corporate Events, and Birthday Parties. We have tailored very special rates and attractive packages to suit all your group needs. The Park also features fully equipped conference facilities to organize your private events or business meetings. You can’t miss the place where you’ll just love the experience! To qualify for group rates and packages you must be a minimum group of 15 guests and more. All Groups must make advance reservations to receive group special rates if your group does not make a reservation at least 2 Days in advance, Park Official Admission Rates will apply. For further information and to book your group outing call us at +971 (0)6 7681888 Ext 538 or get in touch with our Sales Team at sales@dreamlanduae.com. We’ll get back to you within 24 hours. Can’t imagine a better way for rewarding your staff and boosting their performance than a day out away from work! Just head to Dreamland Aqua Park, the largest water park in the region for a guaranteed blast! Dreamland Aqua Park offers a unique experience for corporates staff, clients and brand lovers alike to build up friendship ties, increase loyalty anddevelop team spirit while enjoying our diversified water attractions, sporting facilities and team buildingactivities all set in our unique splendour Oasis like entourage. Whatever is the event you’re willing to organize – a Family Fun Day Out, a Team Building Event, an Incentive Outing or a Day Training! Dreamland Aqua Park has got it all for you. If one day trip is not enough, then you can’t miss our Overnight Camping for a rich and unique experience. Special rate are applicable for groups! Is your company part of our Corporate Partners List? Then just show your Corporate ID and enjoy a great discount. To know more check our "Offers" section! To plan your corporate day out, call us at +971 (0)6 7681888 Ext 538 or get in touch with our Sales Team at sales@dreamlanduae.com. We’ll get back to you within 24 hours. School groups of all ages will love coming to Dreamland Aqua Park. Dreamland provides an excellent venue for all the students to get together and enjoy the great outdoors. Dreamland Aqua Park offers a unique experience for Students and Teachers alike and gives them the chance to build up friendships, reinforce trust and develops team spirit while enjoying our diversified water attractions, sporting facilities,mini zoo and much more. Full Day Admission to all water rides, attraction and sporting courts*. Free lockers room to safeguard and keep personal belongings. Multiple meal options to choose from. Healthy balanced meals and set menus are available. 90 minutes dedicated venue for dining with appropriate shading. Free use of life vests and tubes. Large and convenient free parking lot. Minimum group of 15 students is required to avail Schools Group Rate and Packages. Every 10 Admissions entitles onefree Admission for chaperon/ teacher. A minimum of one week advance booking is required. Visit date need to be on a school operating day. Fridays, Saturdays and Public Holidays are excluded. No personal food o drinks / picnic coolers are permitted inside the park. Proper Swimwear is mandatory on all water rides and attractions. For the safety and convenience of your students please check our Park Rules and Regulation. If one day trip is not enough, then you can’t miss our Overnight Camping for a rich and unique experience. Special rate are applicable for schools! To plan your class outing call us at +971 (0)67681888 Ext 538 or get in touch with our Sales Team at sales@dreamlanduae.com. We’ll get back to you within 24 hours. What more? Dreamland Aqua Park has created a Supper Cool Incentive Program to match your school motivational and social goals. All rewards would be in nature (Free Admissions/Discounted Tickets/Incentives)and would serve as a rewarding program for your teachers and students, as gifts and prizes during school events, competitions and activities or as discounted tickets for your good cause fundraising and charity programs! Enroll your School for this season and enjoy unbeatable benefits and incentives. To know more call us at +971 (0)6 7681888 Ext 538 or get in touch with our Sales Team at sales@dreamlanduae.com. We’ll get back to you within 24 hours. What would be better than celebrating your Child Birthday at the largest family water park in the region! For a splash-tacular birthday party look no further than Dreamland Aqua Park where children can enjoy loads of fun at our dedicated water playground areas "Kids Aqua Play" and "Hippos Island" while older ones will still enjoy the entire thrill at our 30 water rides and attractions. Full day admission to the Water Park with unlimited access to all water rides and attractions. Reserved and decorated venue with balloons for birthday celebration. Meal of your choice as per chosen package. Complimentary Birthday Cake of your choice (Black Forest / Vanilla Fruit Cake). Souvenir gift to the Birthday Child. 1 Free Admission for the Birthday Child and an Adult as a Chaperon including birthday meal. Minimum of 8 paying guests (ages between 3-12 years) is required. Birthday Child and Adult Chaperon are counted separately. Same rate is applicable for Adults and Children alike. Minim 1 week advance booking is required. To plan your Child Birthday Party call us at +971 (0)67681888 Ext 538 or get in touch with our Sales Team at sales@dreamlanduae.com. We’ll get back to you within 24 hours. Two reselling programs are set for Tour Operators, Travel Agents and Hotels. To know more about our Prepaid and/or Concession sales programs please contact us on +971 (0)6 7681888 Ext 538 or get in touch with our Sales Team at sales@dreamlanduae.com. We’ll get back to you within24 hours. Great offers await you at Dreamland Aqua Park! Just keep logging in and checking on our latest offers and promotions. Don’t miss up on our special corporates deals and tie-up promotions. Below are some of our existing partners and deals. Is your company, club or association, part of our Corporate Partners List? Then just show your Corporate ID and enjoy a great discount! Dreamland Aqua Park was the vision of His Excellency Sheikh Abdullah Bin Rashid Al Mualla, Deputy ruler of His Highness Sheikh Rashid Bin Ahmed Al Mualla, member of the UAE Supreme Council and ruler of Umm Al Quwain Emirate to create the First and Largest water park in the region with a main concern - Fun is a right for everyone! Located at Main Reception our information desk is ready to answer all your queries. For further assistance you can ask help from any of our dedicated customer service positioned around the park. Free Parking space for up to 2000 vehicles. Please respect parking signs and note that your vehicle is your responsibility. Please ensure that it is locked and all valuables are removed to prevent any damage or loss. Riding Tubes as well as Children’s Life Vests are provided free of charge. For your safety, both should be used only on those rides that require them. Please note that personal floatation devices are not permitted inside the Park. Pool Depth, Ride Thrill Code, Height and Weight restrictions, as well as, their physical and medical condition. For your safety, our lifeguards are highly experienced and trained please adhere to their instructions at all times. Amateurs and Non-Swimmers should swim always with a buddy or under parent’s supervision. All our splashdown and recreational pools are approximately 1.2m deep with the exception of Lake ‘O’ Waves which goes from 0 to 1.8m deep and The Twister rated as aggressive thrill ride and for swimmers only with 2.5m deep. Our Clinic is located next to lockers room by the main entrance and equipped to handle all minor emergencies related to park’s activities and is adequately staffed with experienced paramedic team. In case of emergency please ask help from lifeguards or customer service team and they will be ready to assist you. Dedicated Prayer Rooms for Ladies and Gents are made available at the Park. However, a proximity mosque within a 5 minutes’ walking distance from main Parking lot is available; whereas all daily calls for prayers, as well as, Friday’s Noon Prayers are performed and practiced. Both male and female toilets and showers are located conveniently around the park. For your hygiene and safety please make use of toilets and take shower before and after entering any pool. Sunbeds are made available around the Park with shading umbrellas at no extra cost on first come first served basis. No need for cash anymore! Had enough of wet money! Lost or misplaced here and there! Why the hassle? Stop and enjoy our Cashless Payment System. Now, you can store electronic credit on your Wristband and pay with it to buy whatever you need from park’s different Food and Retail Outlets. Any leftover would be refunded to you on your way out. To load money, ask our ticket booth cashiers or customer service officers for assistance. All Guests must have a valid ticket to enter. Children below the age of 12 must be accompanied by an adult. Multiple entries are not permitted to the park. Guests wishing to re-enter must have a special gate pass when exiting. All bags are subject for inspection. Bringing food, drinks, glassware, picnic baskets, hazardous or dangerous items and pets are not allowed inside the Park. Bicycles, scooters, and personal flotation devices are not allowed inside the Park. Ticket refund policy. All tickets are non-transferable and non-refundable, No substitutions or changes will be allowed. This includes power outages and natural disasters. Prices, operating schedules and attractions availability are subject to change without prior notice. Dreamland Aqua Park does not issue rain checks or refunds due to inclement weather. The Management reserves the right to refuse admission for any guest and to control occupancy when required. Maximum Park Occupancy is 7000 visitors. Fridays and Public Holidays are strictly reserved for families, holders of season passes and pre-approved groups. Dreamland Aqua Park is a family oriented park. In view of preserving healthy family environment, modest dress and swimwear is expected from all guests. Revealing or offensive clothes, provocative or thongs swimwear are not considered appropriate and are not allowed. Traditional swimwear is required to participate in any of the water rides and attractions. Pants, cutoff shorts, denim and /or cotton wear are not allowed. Swimwear with rivets, buckles, belts or metal ornaments are not allowed on certain rides. Displayed tattoos must be in good taste and not offensive to our family environment. Running, jumping, diving and horseplay are not allowed inside park premises. Proper Swimwear is mandatory to use water rides and attractions. Swimwear with exposed buckles, rivets, zippers or metal ornamentation is not allowed on specified water rides and attractions please refer to safety guide posted at each ride. Always swim with a body never swim alone. Children under the age of 12 must be accompanied or supervised by an adult. Please shower before and after entering the pool. Food and drinks are prohibited inside the pools. Glassware and other hazardous items are prohibited inside the park. Always keep your slippers on while outside water. Caution! Pavement might be very hot! Apply adequate sunscreen at least 15 minutes before entering the pools. For your protection, Please follow safety rules posted at each ride and listen to the lifeguard instructions before riding any attraction. Our lifeguards are highly trained and qualified. They use one whistle blast to gain the attention of the guest. Please give prompt respect to instructions given by guards and ride attendants. Many rides and attractions are dynamic and thrilling. Most of them require a minimum height of 48"or 1.2m. These rides are not recommended if you have a history of medical problems such as brittle bones, heart decease or High blood pressure, recent surgery, neck or back problems, or if you are pregnant please refer to Safety Guide posted at each ride. Dreamland Aqua Park practice ZERO(0) tolerance policy against any offense related but not limited to theft, blasphemy, harassment of any kind and/or breaking park’s rules and regulations. Some language, gestures and suggestive art or breaking lines while queuing on rides, as well as, showing personal affection in public, may also be considered inappropriate and in violation to UAE public conduct law. Any person found in insubordination or refuses to comply with Dreamland Admission Code, Dress Code, Code of Conduct and safety code implied at the park including any other unsafe act or offensive behavior judged inappropriate by the management or existing laws could be subject for detention, arrest or removal from Park premises. Many rides at Dreamland Aqua Park are dynamic and thrilling. There are inherent risks in riding any amusement ride. For your protection, each ride is rated for its special features, such as high speed, steep drops, sharp turns or other dynamic forces. If you choose to ride, you accept all of these risks and release Dreamland from any responsibility. Restrictions for guests of extreme size (height or weight) are posted at certain rides; guests with disabilities should refer to our Ride Admission Policy available at Dreamland Guest Services. Participate responsibly; you should be in good health to ride safely. You know your physical conditions Dreamland does not. If you suspect your health could be at risk for any reason, or you could aggravate a pre-existing condition of any kind, DO NOT RIDE! All Persons adults or children entering Dreamland Aqua Park do so entirely at their own risk. Dreamland Aqua Park management team, the proprietor or anybody or company associated with Dreamland will not accept liability or responsibility with respect to any injury or loss, including any fatality or damaged property inclusive of anything attributable in part or whole to any act or omission on the part of Dreamland Aqua Park, its staff or agent. What are the rules regarding swimwear? Proper bathing suit has to be worn. Swimwear with metal rivets, buttons, buckles, snaps, zippers or sharp objects will not be permitted on the slides as it damages the rides and could potentially injure riders. We do not consider undergarments as swim wear and will not be permitted.There are NO EXCEPTIONS as the rules are for your protection and safety. Are coolers, outside food or drink allowed inside the water park? No, we do have a variety of meal options at our food court and a number of food stands throughout the park. What age are children free? All children under 2 years old are free. Do I have to pay if I am only coming to watch my children? Yes, you will have to pay the normal rate. Can you leave the park and re-enter? Please note, your daily pass is valid for one admission only on day of visit. Multiple entries/exists are not allowed unless for emergencies or reasons judged valid by the management. Parking at Dreamland aqua park is free. Are lockers available inside the park? Lockers are available for free. Are lifejackets available for small children? Lifejackets are available for free is based on an availability basis. Dreamland Aqua Park is located on the scenic coastline of Umm Al Quwain, one of the seven emirates of the United Arab Emirates. On the Etihad Road (E11), 8 Km from Umm Al Quwain R/A straight towards Ras Al Kheimah, you will find Dreamland Aqua Park on your right just after the iconic landed Cargo Plane of UAQ Aero club next to Barracuda Beach Hotel and Resort. 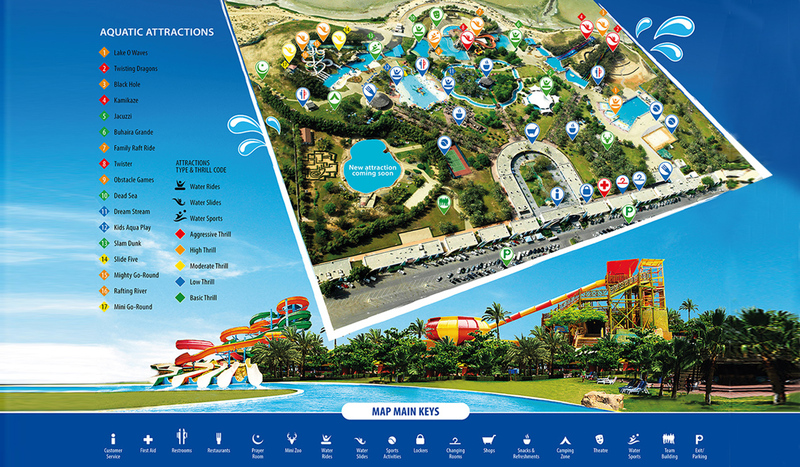 Dreamland Aqua Park is the largest family water park in the region with over 250,000 square meters expanse of lush, green, landscaped gardens. Located on the scenic coastline of Umm Al Quwain, it has become more accessible to tourists coming from other Emirates. Dreamland Aqua Park started out with 25 water attractions enjoyed by all age groups. In September 2004, five more attractions were added to the already thrilling and heart-stopping wet rides. Dreamland also has overnight waterside camping facilities in either tents or cabanas in addition to a Mini Zoo and Sporting Facilities. Food is not a restraint at Dreamland with 5 different outlets to suites all your tastes. The Park is operated all year round with a daily capacity of 5,000 thousand visitors. Fridays and Public holidays are for families, pre-booked groups, and membership holders. Bachelors are restricted. Thank you for taking time in helping us improve our services!